In this lesson, we will learn how to find measures of arcs. Given that 𝐴 𝐵 is a diameter in circle 𝑀 and 𝑚 ∠ 𝐷 𝑀 𝐵 = ( 5 𝑥 + 1 2 ) ∘ , determine 𝑚 𝐴 𝐶 . Which of these is equal to the measure of an arc? 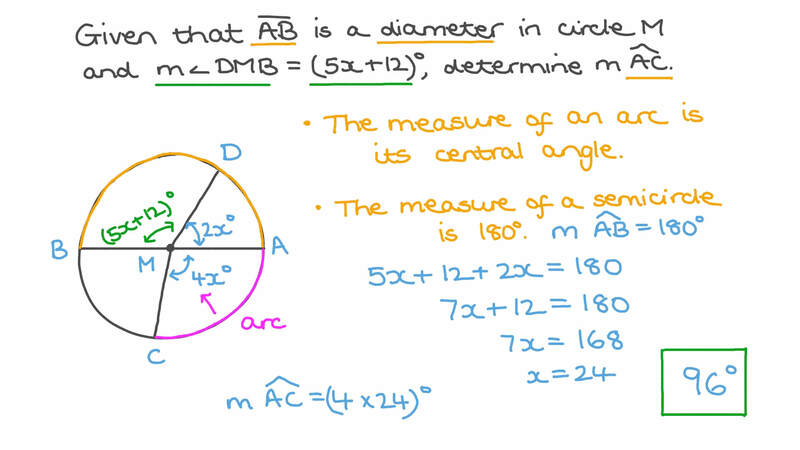 Find the measure of the arc that represents 1 6 of the circumference of a circle. Given that 𝐴 𝐵 is a diameter in circle M and 𝐴 𝐶 𝐷 𝐵 = 8 5 6 7 , determine 𝑚 𝐴 𝐶 𝐷 . An arc measures 5 3 1 2 0 of the circumference of a circle. What angle does the arc subtend at the centre? Suppose that 𝑚 ∠ 𝐵 𝑀 𝐸 = 8 4 ∘ . Determine 𝑚 ∠ 𝐷 . Find 𝑚 ∠ 𝐴 𝐶 𝐷 and 𝑚 ∠ 𝐵 𝐴 𝐶 . Suppose that points 𝐴 and 𝐵 on a circle centre 𝑀 make ∠ 𝐴 𝑀 𝐵 1 9 times its reflex angle. What is the minor arc 𝐴 𝐵 ? Given that 𝑚 ∠ 𝐷 𝐴 𝐵 = 8 2 ∘ and 𝑚 𝐴 𝐵 = 5 0 ∘ , find 𝑚 ∠ 𝐴 𝐵 𝐶 . Given that measure arc 𝐴 𝐶 = 8 7 the measure of arc 𝐵 𝐶 , find 𝑚 ∠ 𝐴 . Find 𝑚 𝐴 𝐶 . An arc has a measure of 1 3 0 ∘ . What is the measure of the central angle? What is the measure of the inscribed angle? What is the measure of the circumscribed angle? Given that 𝐴 𝐵 is a diameter in circle 𝑀 and 𝑚 ∠ 𝐷 𝑀 𝐵 = ( 3 𝑥 + 1 2 ) ∘ , determine 𝑚 𝐴 𝐶 . Find the measure of the arc that represents 3 8 of the circumference of a circle. Given that 𝐴 𝐵 is a diameter in circle M and 𝐴 𝐶 𝐷 𝐵 = 3 2 1 1 9 , determine 𝑚 𝐴 𝐶 𝐷 . Given that 𝐴 𝐵 is a diameter in circle M and 𝐴 𝐶 𝐷 𝐵 = 9 1 4 , determine 𝑚 𝐴 𝐶 𝐷 . Given that 𝐴 𝐵 is a diameter in circle M and 𝐴 𝐶 𝐷 𝐵 = 5 1 4 , determine 𝑚 𝐴 𝐶 𝐷 .